Our low energy fan filter units also consist of low sound and a low profile. The 170 watts filter unit uses less energy which results in lower operating costs. The units contain a three-speed switch feature on all 2 foot and 4 foot units. The unique design and low noise level provides an affordable high efficiency air filtration system that delivers up to 800 CFM of ultra clean air with low energy consumption and low heat gain. The system is available with HEPA or ULPA filters and can be built to meet practically any electrical requirement. It is ideal for Class 10 through Class 100,000 cleanroom systems and available in various housing types and profiles. 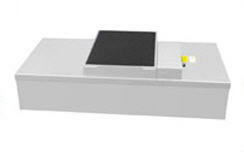 The tapered design allows easy installation and maneuvering into the ceiling grid and, once installed, the unit provides complete flexibility to control speed and operation of the unit from room side. As one of the most innovative Fan Filter Units (FFU) available, this unit combines low watts, low sound and a low profile. The unit sound level is only 49 dBA, and by operating at 170 watts,it uses less energy, resulting in lower operating costs. Plus, the unit still measures less than 13 in. (330 mm). Standard sizes include 2 ft x 4 ft (600 mm x 1,210 mm), 2 ft x 3.5 ft (600 mm x 1,057.5 mm), 2 ft x 3 ft (600 mm x 905 mm), and 2 ft x 2 ft (600 mm x 600 mm) units. Custom size units are also available.